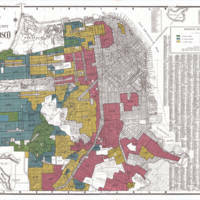 Redlining security map for San Francisco, CA. 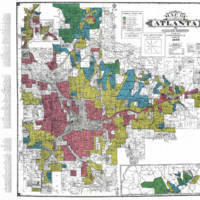 Redlining security map for Atlanta, GA.
How did home finance contribute to racial segregation? In the 1930s, economists in the HOLC and FHA created a large-scale information clearinghouse for real estate data. Real estate information was locally created and managed in handwritten or typewritten form, so it was difficult to assess real estate trends on a national scale. Several economists with training in the new field of real estate economics created a survey of banking and real estate leaders in more than 200 cities around the country. These surveys laid out, neighborhood by neighborhood, what the demographics were, what the rental and ownership levels were, and where business leaders thought good neighborhoods for investment were. The HOLC and FHA officials created and published maps from these surveys, color-coded from the “best” neighborhoods (green) to “hazardous” areas (red). These maps came with documents, called area descriptions, that detailed the features of the neighborhoods. Neighborhoods with African Americans were almost universally rated hazardous and coded red, alongside those with European immigrants. This process institutionalized local prejudice and directed both private and federal lenders to withhold their investment from central cities and channel it to newer, whiter, suburban communities.